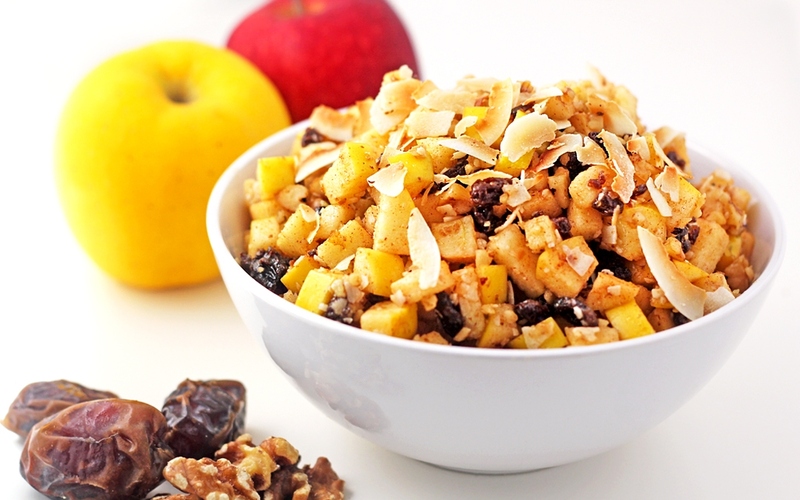 Haroset is a traditional recipe for Passover that usually contains apples, nuts, dried fruit and (often) kosher wine. There are many variations, including cooking the apples or adding dates to make the haroset more paste-like. In this version, we used fresh apples, along with other powerhouse ingredients like cinnamon (anti-inflammatory and helps control blood sugar), honey (anti-bacterial), walnuts (contain omega-3 fatty acids, which increase heart health), and coconut flakes (full of iron and zinc). The walnuts and coconut are also toasted on low heat to bring out the flavor while still preserving the healthy fats. Note: If a vegan version of the recipe is desired, substitute maple syrup for the honey. 2. While the walnuts are toasting, begin coring and dicing the apples into bite-sized pieces. Add apples to a large bowl and toss with the cinnamon and honey. 3. Once walnuts and coconut flakes are toasted, set aside until cool enough to handle. Roughly chop the walnuts and add the walnuts and coconut flakes to the apples. Toss and either serve immediately or refrigerate until served.